When it comes to companies delivering workplace messaging efficiency, Slack is the name to beat. And Microsoft hopes to do just that, or at least grow the popularity of its lesser known offering: Teams. 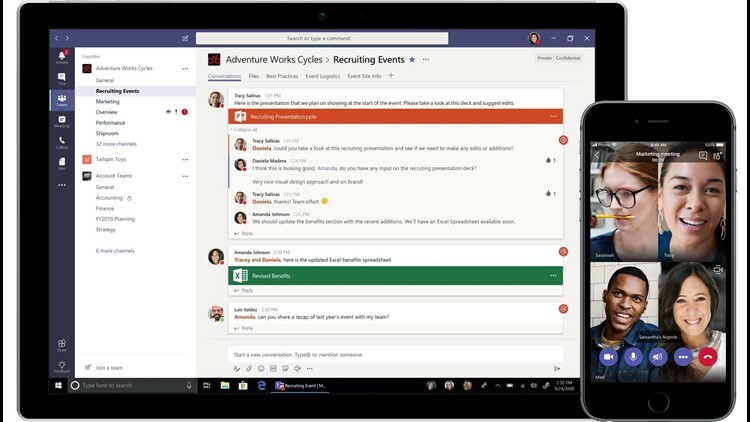 The Redmond, Washington, company announced Thursday that it is launching a free version of Microsoft Teams, essentially matching Slack's free version (more features are available for those who pay for subscriptions). This move could make Teams more appealing to those of you who own a small business, or even freelance. The free version of Teams is limited to 300 people, so if your company or hub exceeds that sum, you’d have to upgrade to a tiered subscription service, part of Office 365 Business Essentials. You’re looking then at a minimum of $5 per month, per person (with an annual commitment), or $12.50 per user per month for more premium services. According to Microsoft, more than 200,000 businesses across 181 markets have been collaborating inside Teams since its launch last year. All those companies have been paying up to now, of course. So what do you get for free? For starters, unlimited chat messages and search, along with built-in audio and video calling for individual team members, groups or full team huddles. You also get 10 gigabytes of team file storage, plus an additional 2GB of storage per person. Microsoft Teams is offering a free version. Microsoft also is pitching Teams as a service that offers tight integration with the online versions of Office, which includes Word, Excel, PowerPoint and OneNote. You’ll also be able to integrate Teams with other business apps from a roster that includes Adobe, Evernote, Github and Trello. And Microsoft says you’ll be able to securely collaborate in the free version with people inside or outside your organization. You’d have to subscribe for such services as 24/7 phone and web support, Exchange email hosting and custom email domains, or to update the per person storage limits. Some services come to the free offering later in the year. One is the ability to blur the background during a video call so you can focus on the mission at hand and not the potentially distracting environment behind the person you’re talking to. The free version, Microsoft says, will be made available in 40 languages. Even prior to the free Teams launch, the service is competing quite well against Slack, says Gartner research director Larry Cannell, who has praise for both. “I’ve been involved in the enterprise collaboration market for twenty years and Teams may be the best “version 1” product I’ve seen Microsoft launch,” Cannell says. Cannell points out that Microsoft is using its overall market clout to push Teams. For instance, Teams is included in all of the company’s Office 365 bundles. And what about tried and trusted Skype for Business? It still exists, but Microsoft is looking to retire that enterprise-focused instant message product, with Teams evolving as the primary way businesses communicate in Office 365.